Rich cocoa powder is added to my favorite cookie recipe! Chocolate Peanut Butter Cookies are so easy to make and a family favorite recipe they will ask for time and time again. Today, I’m going to tell you a little story about these cookies. I hope you enjoy it because it’s also a brief little snippet of life when the hubs and I were first dating. There are some fond memories of those crazy few months before he took the plunge and moved to Virginia. They make me smile when I think back on them. When I first met the hubs, I was travelling back and forth from DC to Cleveland almost every weekend. I should probably back that up a bit. He lived in Cleveland and I lived in Virginia. We met unconventionally online. I won’t go into the details on that part, but it wasn’t an online dating site or anything like that. I remember that first drive to Cleveland. It was pitch dark, I was the only one on the road at times, and I was pumped up on adrenaline meeting this man that I had been chatting with for a month. Yes. A month. For some that’s too long and for some that’s way too soon. For me, I felt like it was the perfect time. I couldn’t wait any longer. Of course, you know me! If not, nice to meet you! Thank you for dropping in to my little blog world and checking me out. I’m A Kitchen Hoor. Meaning, I like to be in the kitchen cooking and baking. So, the first trip I took to Cleveland, that’s just what we did. Using Cool Whip containers, an old whisk, some creativity, and lots of fun we baked cookies. Chocolate chip cookies to be exact. It was rough going. Something about creaming stuff made it difficult (and my arms tired), but we had fun dancing in the kitchen baking cookies. I know. These aren’t chocolate chip cookies. Be patient. I’m getting there. The hubs worked in a hospital and one of his coworkers was having a rough time. I think someone was ill and they were trying to raise money to pay their bills. This is way before the crowd funding thing started. So, what’s a person to do? Have a bake sale! Yup, not only did I schlepp my KitchenAid but also bowls, utensils, baking sheets, and silpats to Cleveland. I made chocolate chip cookies, oatmeal raisin cookies, and chocolate peanut butter cookies. And there ya have it! Except it was a completely different recipe that I cannot find to save my life. I could not stop eating the batter while I was baking those cookies. By the time the night was finished, I think I had at least 4 of them? So, I set out to try to recreate those cookies. I cannot believe I haven’t shared a peanut butter cookie recipe on my blog. It’s one of my favorites!! I will have to remember that after I share this recipe. I thought, “Why mess up a good thing?” So, to make these cookies, I used part of that recipe in this recipe. Just look at that dark, rich chocolate in these chocolate peanut butter cookies! That’s all thanks to Rodelle cocoa powder. You don’t even need a whole lot to get such a rich, chocolate flavor, too. That’s the best part of this cocoa powder. It truly goes a long way. I also used some of their delicious vanilla extract in these cookies, too. I’ve used their vanilla and their almond extract in cookies. Its flavor is so amazing that it doesn’t take as much as those other imitation extracts. You can’t go wrong with any of their products, to be exact. I hope you have enjoyed the posts for #Choctoberfest this week. Don’t forget to enter the giveaway below! And, finally, make sure to follow Rodelle on Facebook, Pinterest, Instagram, and Twitter. They have amazing recipes on their site and SO many products that are top quality. Cream the sugars, shortening, and peanut butter together until light and fluffy. Add the adds one at a time. Stir in the vanilla extract and salt. Combine the flour, cocoa powder, and baking soda. Slowly add the flour mixture to the peanut butter mixture until incorporated. Spoon by tablespoons onto a baking sheet lined with a silpat or parchment paper. Bake at 325 for 12 to 15 minutes or until lightly darkened around the edges. Remove from the oven and cool 5 minutes before removing to a wire rack to cool completely. Totally love this story. And of course, the cookies sound amazing. Thank you! I always think back on those early times fondly. That HUGE apartment so full of air leeks and love. Makes me fall for the hubs all over again. 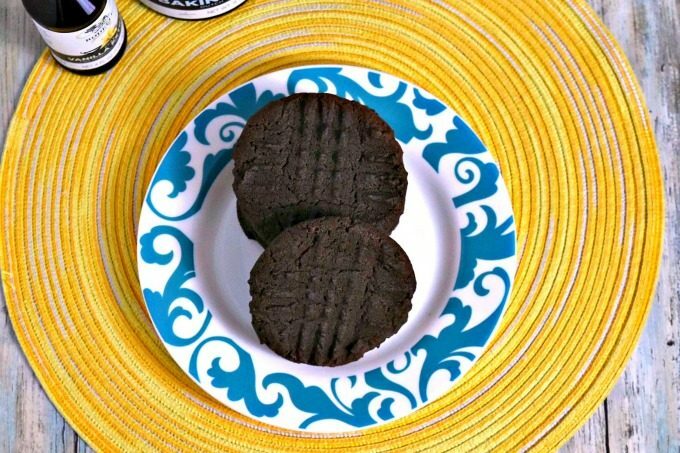 Mmm I love the deep dark chocolate color of these cookies – they sound heavenly! YUM! They are so good! Rich chocolate and peanut butter together is so good. I think I have to make another batch.